rituals | Broomsticked The Life and Times of a Real Witch. Full moon group candle intention ritual on the day Prince died. Letting go of what has passed and focusing on life in the here and now. I was so excited for tonight. Had been preparing a huge group intention candle for friends and clients. Plus had taken on 6 individual spell orders instead of my usual 4. Then about 10am the tv flashed to a special report, Prince had died. Shock, then tears, then just sadness hit. Luckily I saw my therapist at 1pm and was able to process and feel and get back on track for this very special full moon. It wasn’t easy I’m so grateful it was therapy day. The universe was looking out for me there, for sure! So here I am , starting tonight and happy and at peace, doing what I love. I wish that for all of you, through tears, shock, bad days, you still find that one moment where you feel love and joy and connected to all. Happy Full Moon and Huge Blessings to all . Walking with our ancestors while the veil is thinning. I miss my Grandmother and even though so far I’m not feeling her as strongly as others who have passed, I know she is there. you to the ones you didn’t, but without them, … you and the ones you knew, wouldn’t be here. When were young, family advice can seem stupid, old fashioned and not important, as we get older , we realize sometimes they did indeed know what they were talking about. This time of year is perfect for using Tarot, Runes or just quiet meditation to ask for the advice of the thousands whose love created you. Your tribe from the other side. They may not of been saints in life, but that alone made them wiser, and now on the other side they have a tremendous view, you don’t. Speak to them, listen, and thank them often. Even if you do not know exact names call to your family beyond. And know you are blessed. 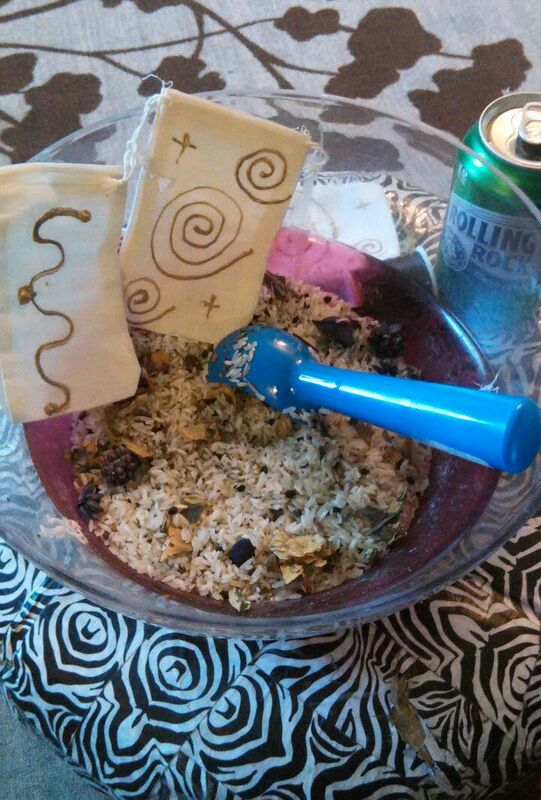 one thing I can sell on all three and this batch is my Oshuns blend for love and money drawing and magick. OMG it smells so good. This is my favorite blend. I could make these forever. I don’t have them listed yet, getting them stuffed and sewn while game is on. Then will photograph and get them listed . The oils I use are different in this fixed rice , it’s a mix I get locally, these will run 19.99 with free shipping in the US as compared to my 14.99 range ones. calm of a fall breeze..And whisper thank you into the wind. 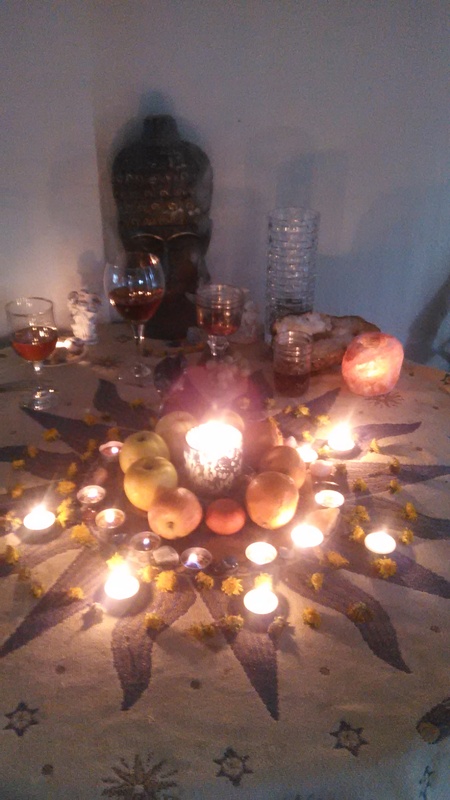 Fall Equinox Mabon in Ritual and how to work in that Mercury Retrograde. Aww, sweet sweet Mabon that brings in my favorite season of Autumn. 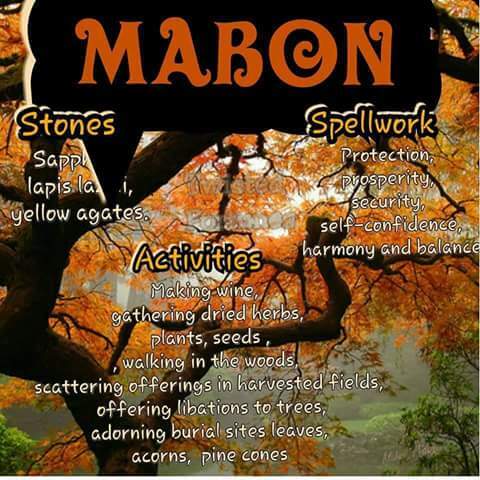 There are many great simple solitary ritual ideas for Mabon, that usually involve reflections and giving Thanks for all that you have brought to harvest in this past year. The added bonus of Mabon in a time of Mercury Retrograde is, Mercury Retrogrades are all about looking back and seeing the past with new clarity. The combination of the two gives us chances to see more clearly and honestly the true blessings that have manifested over the year. Things that seemed like endings that became brighter beginnings, and any reoccurring situations that you handle in new more authentic ways should be given much attention and gratitude over. Mercury Retrogrades help us to see more clearly where we harvested even when we may of been in more grey or shadow selves. And the gratitude we express during Mabon, can help us with brighter, more authentic harvests for many years ahead. Simple Mabon in the Mercury Retrograde Ritual. Find things to be grateful for, it may seem hard but they are there. Carve words or symbols of thanks for your personal harvests into tea lights or small candles of your choice. 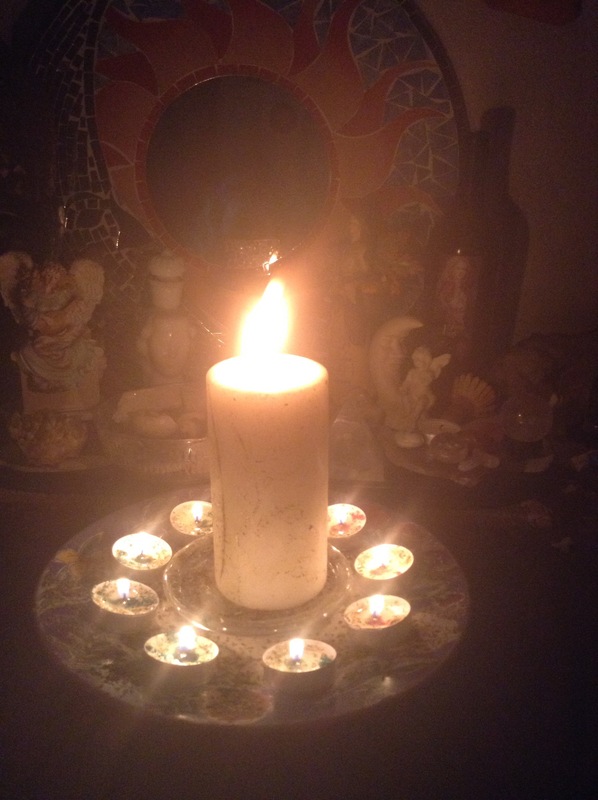 While burning the candles give thanks to your chosen higher powers. And feel your connection to all the world around you. Samhain is the final harvest and gratitude based Sabbath of the year, from Mabon to Samhain do your authentic best to keep gratitude alive during this time. The time in between these two Sabbaths is a very special magical time, try to walk it in Grace and Gratitude. Make memories to look back on next year during Retrogrades that are full of good feelings and you’ll be surprised how magical this time was for you! Visit my shop of Witchcraft Spell Castings Services anytime!